Introducing The Sanctuary at The Lodges at Eagles Nest! A Sanctuary is defined as a place of refuge and safety, often a spiritual one. With its church-style, 30 feet high cathedral ceiling great room, The Sanctuary is very appropriately named. Built in 2007, the home was designed to offer the perfect balance of authentic mountain architecture and rustic elegance. 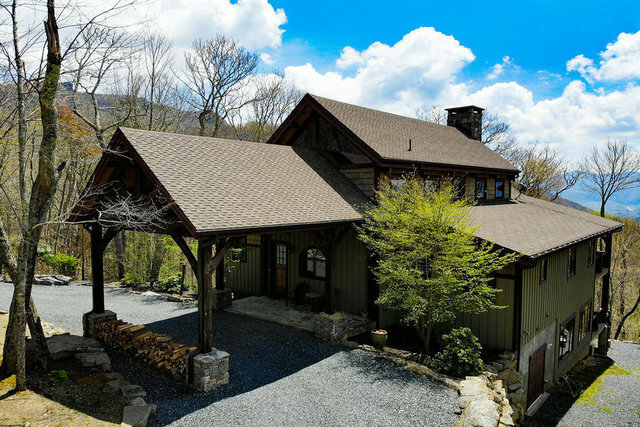 Resting on a nearly 5 acre perch at just over 4,500 feet of elevation, The Sanctuary features an open gourmet kitchen and bar area, free-flow to the rugged hardwoods of the great room and floor-to-ceiling stone fireplace. Pass through barn-style sliding doors to the 1st master suite framed by high tongue and groove wood ceiling. The master bath offers a refreshing travertine tile steam shower to get the toxins out and renew the senses. On the opposite side of the main level, you'll find another equally impressive master suite and bath for a large family or multiple families sharing a vacation. The full, walk-out basement offers another guest bedroom, bonus bunk room, full bath and casual game/den area. Multiple decks and hot tub capture some of the best sunrises and sunsets the NC High Country has to offer.